Island-inspired, antique furniture, hand-picked from around the world are constants of this home's serene decor, giving each space its unique atmosphere while unifying the entire villa with relaxing vibes. The home has been designed to take full advantage of tropical airflow by adding wide windows throughout, which fill the home with light and allow for a constant island breeze. Beyond the main entrance and hallway, your living space boasts a family gathering room complete with an elegant, antique dining table offering seating for six. Your fully equipped kitchen comes complete with granite countertops and state of the art, stainless steel appliances, ample cabinet space, cookware and all kitchen ware, which all make preparing meals on vacation a pleasure. If you enjoy turning your fresh veggies and fruits into delicious smoothies and juices, you will be delighted to find your very own Vitamix juicer in the cupboards. The main dining room with wall to wall windows opens directly onto your enchanted garden filled with fruit trees, ample seating for al fresco dining as well as lush, tropical surroundings. Four well-appointed bedrooms offer style, comfort and inviting, beach themed, soothing private spaces. There is air-conditioning in every bedroom, ensuring that you will have a great night’s sleep. The master suite - located on the second story of the home -, offers a comfortable California king bed along with its en-suite bathroom, a spacious closet and it opens directly onto a private terrace boasting ocean views. The terrace offers a seating area complete with a bar top table, perfect for an evening game of cards on this enclosed, tiled lanai. Two beautifully furnished guest bedrooms follow the master offering queen beds and shared access to a hall bathroom. Kick back and lounge on the comfy sleeper sofa in the living room located just off the master bedroom. The living room features plenty of comfortable seating. Enjoy games on the PlayStation, family time or your favorite show on your big screen TV. And just when you feel like there is no more to be discovered, you will find a staircase leading from your living room's lanai to the next floor up to your roof top sundeck. 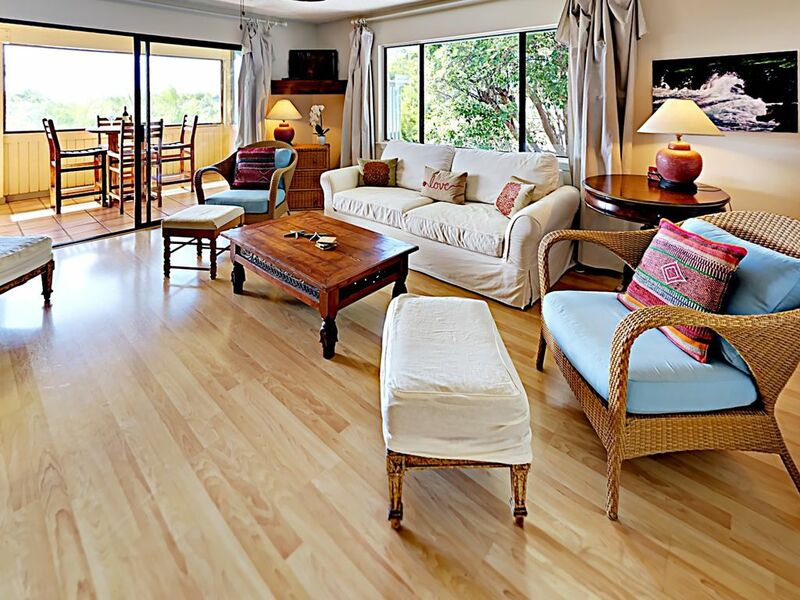 This expansive private deck boasts fantastic, 360 degree’ views of the azure ocean, from Molokini crater, Kahoolawe and Lana'i towards the West Maui Mountains and Maalaea Harbor. This is your perfect spot to do your morning yoga stretches to prepare yourself for a beautiful Maui day. Entertain your guests on the roof deck with a tropical mango smoothie from the garden (when in season), while never letting the Pacific out of your sight. The deck also provides you with prime seating to a whale show in season (from November to April). As evening falls, swap stories from the day’s adventures under the expansive Hawaii’s clear skies and try to keep up counting the numerous shooting stars. As an added bonus, enjoy beautiful firework shows during holidays over Wailea Beach and over Wailuku, in the direction towards the airport. The Ohana (additional living space and fourth bedroom) is located kitty corner from the main entrance of the home on the first level. The Ohana offers a secondary full kitchen and a full bathroom with a vessel sink; in addition to lots of privacy. It has been completely renovated, with travertine floors throughout, granite countertops, stainless steel appliances, and tropical furniture including a queen size bed and a sofa bed in the living room. Beach chairs, umbrellas, snorkeling gear, and a boogie board are provided for guests and can be found in the trunk on the covered lanai. Additional guest amenities include complimentary high speed Wi-Fi, A variety of Direct TV channels and HBO, binoculars for whale watching, an in-unit, commercial washer/dryer, and parking for 4 vehicles. This home was fine and sufficient for the purpose, but considering the price it fell short. Only the kitchen and dining room are on the first floor. The living and bedrooms are on the second floor. The master was fine but the other 2 bedrooms were quite small. One of the bedrooms couldn’t even accommodate our baggage. The carpet really needed to be replaced in the bedrooms and there is definitely a pest problem. The Ohana (extra efficiency) was roomy but musty. There was only online access to any TV (Apple TV or Roku). No antenna. The beds were very comfortable, A/C was via individual units in the bedrooms and worked well. Nice view from the third floor rooftop deck. There was also a nice screen enclosed porch on the second floor. All in all, it was fine, but underwhelming. Mahalo for taking the time to provide us with this feedback! We appreciate it very much as it helps us in ensuring this beautiful Villa is in outstanding condition. We have since scheduled all the carpets within the home to be professionally cleaned and have arranged for a Pest Control treatment as well. In regard to the TV, we have installed a new DirectTV app which will allow our guests to watch live streaming cable moving forward. I sincerely apologize we were unable to address these matters during your stay, but am thrilled to hear you were still able to enjoy your time with us while here on island! We also love the stunning ocean views and the added comfort provided by the A/C. It was truly a pleasure having you as our guests and we hope to have the opportunity of welcoming you back on a future stay! We would love to share all of the changes we have made, all thanks to your detailed response towards your stay. Warm Aloha, Your Sunny Maui Vacations Ohana. We thoroughly enjoyed our week in Kihei. The house was well stocked and planned out. We utilized every room and amenity! All items you need to go spend the day at the beach are available. I would only suggest renting boogie boards as all but one at the house were broken. The appliances are all very modern and updated. Everything we needed to cook was easy to access in the kitchen. Loved the views, the breeze, the sunsets, the sunrises and the location! Perfect spot to enjoy all of Maui. Thank you for a great vacation! Perfect house, beautiful views, spacious, clean and had everything and more that we needed for cooking, cleaning and the beach! My only complaints would be that they give you a small trash can for a house that accommodates 8people and only 2 rolls of toilet paper for our 6 night stay for 8 people that cost $5700. Minor stuff but just a suggestion for the rental company to better serve its guests! We would definitely rent this place again!!! We loved staying here. The house was super clean and had all the amentities we could possibly want. The property management company was very attentive and pro-active. Nice neighborhood, close walk to beach and super easy location to be in. Would highly recommend and we’d stay there again. Mahalo for your kind review on our property! We are so glad you enjoyed your stay and the view. Please reach out if we may assist you in the future. Great house. Great location. Super great people to work with. Roomy, clean and lots of amenities. Best of all was everyone I talked to or did business with from initial contact to checkout. Super friendly, helpful and on task. Mahalo for your review, we appreciate you taking the time to share your experience. We are so glad you enjoyed your stay with us!